Three children and an adult were injured in a Thursday morning crash involving a school bus in Massachusetts, according to police. 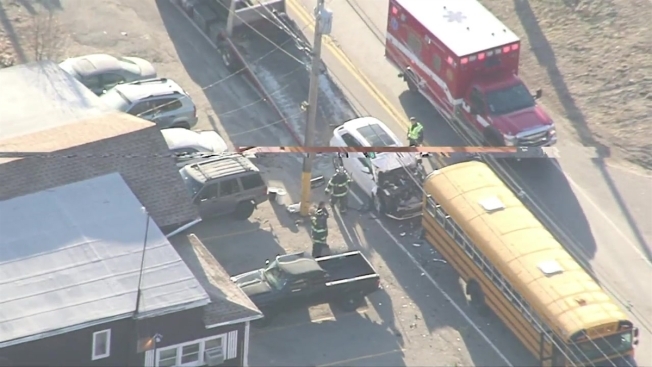 Sky Ranger was over the scene when students left the bus at the scene of the crash, which happened on Clark Street in Norfolk and involved an SUV. Three students and the school bus driver were injured and taken to Norwood Hospital for minor injuries, according to police. Authorities say there were 17 high school-age children on the bus at the time. The bus left the scene under its own power, but the SUV had to be towed. Crews were also seen cleaning up debris. Another bus came to the scene to pick up the students, who attend Tri-County Regional Vocational Technical High School, and the school's principal rode the bus with the students to ensure they were all OK, according to a school spokesperson. No names were released and no charges have been announced.